The Green Futures Foundation is a non-profit organization that partners with local restaurants to recycle waste vegetable oil into clean burning biodiesel fuel. Proceeds from this fund raising activity are used to fund local green education programs and scholarships for students interested in studying renewable energy, energy efficiency, and sustainable living topics. A simple idea that turns a waste product into needed fuel, Green Futures has hit upon a novel way to incetivize restaurants into greening up their operations. Today, restaurants look on their used fryer oil as an expense. Either a facility pays to have old oil taken away or they are paid a small amount for someone who recognizes its value. Once it’s gone, problem solved. A cost of doing business, fryer oil is simply a consumable they use to cook their dishes. This unglamorous side of the trade can now be turned into a positive–and a promotional tool, thanks to the Green Futures Foundation. And what do they do with that used oil? They recycle it, refining it into biodiesel fuel. And their goal is to partner locally, using local oil to fuel local municipal vehicles. The mission of this non profit is to use the deduction as an incentive for restaurants to care about where there waste oil goes–and more importantly, care about what happens to it after it leaves their grounds. 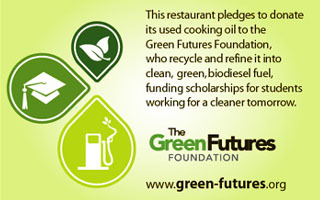 As a spin-off benefit, Green Futures is spreading the word about restaurants who donate their oil. Through their website, working with schools and social media campaigns, Green Futures promotes their restaurant partners and sponsors. “We at Oye Cuban Grill are very excited to participate and Sponsor Green Futures Foundation and their program. Once we saw the program they have developed we wanted to become involved and participate. They are touching all the key bases, recycling, promoting green fuels and education for the next generation”, said Ian Guiterrez, founder of Oye. And as possibly the biggest benefit of all, Green Futures is working to create scholarships and educational programs that benefit South Florida. For more information, please visit their site at green-futures.org.